Harry’s Razor is one of the new subscription grooming services to gain traction over the past few years. The shipping and handling industry is flourishing throughout the country, and Harry’s makes it easy to replenish your razors and shave cream without leaving the house. Unlike some of its competitors, Harry’s is more than a marketing ploy; the majority of its staff are engineers, craftsmen, and chemists. Interestingly, Harry’s is also committed to various social campaigns. Keeping true to their base clientele, the company spends a lot of resources helping men rediscover the core components of masculinity. Harry’s wants to help eliminate outdated hallmarks of masculinity and serve as a valuable resource for men in the modern world. The Harry’s claim to fame is the company’s selection of full-featured starter sets. You can purchase these sets for as little as $8, and they ship with everything you need to get the most from your Harry’s subscription. The package includes a reusable handle, a cartridge for five blades, a can of Harry’s shaving cream and a travel cover. As an added flair, the reusable blade can be selected in one of three colors: orange, blue or olive. For those who prefer experimenting with premium gear, Harry’s offers an expanded starter set that ships with three blades and a zinc razor handle. The metal razor handle adds a sense of weight that helps some men feel more control over their shave. Though most users will receive Harry’s razor as part of the starter set, it’s possible to purchase one through the website’s shop. Like the starter sets, users can choose between two razor models: the Truman and the Winston. 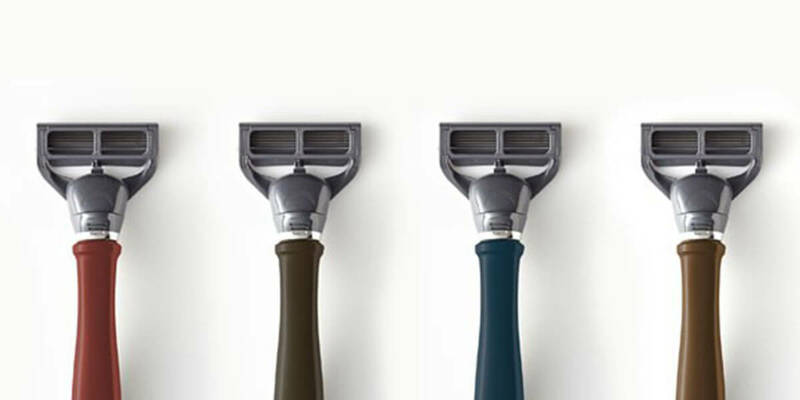 Harry’s Truman razor is a plastic device that ships in four colors. This model will feel familiar to anyone who’s shaved with a basic plastic razor, but it will last much longer. The Truman razor has some level of weightiness, but much less than a metal razor. The Winston razor is the premium option for those requiring the weight of an alloy-built device. The additional body of the Winston makes it easier for shavers to push into their skin for a clean shave. As a bonus, Harry’s users can engrave their initials into their metal Winston razor; the service costs $15 extra dollars, but it helps make your razor feel unique. Blade quality is a very subjective topic in the world of shaving, but most men agree that Harry’s blades get the job done well. The blades themselves are manufactured in a German factory, and they are built of Swedish steel. Each features a lubricating strip that promotes a smooth shave. Unlike cheap drug-store blades, the lubricating strip makes a big difference. The only blemish on the company’s blade quality is their flex hinge technology. Harry’s blades bend to the exact contour of a man’s face, but this feature can be annoying for certain users. Some reviewers describe the flex hinge as taking control away from the shaver. Since Harry’s offers no alternative, men who prefer a firmer shave are left entirely in the dust. In addition to their blades and razors, Harry’s is gaining traction in the skincare market. In early 2018, the company raised over $150 million for the research and development of face wash and grooming products for men. Since then, the company started offering four different skincare products: body wash, face wash, bar soap and face lotion. Like Harry’s shaving cream, these products are developed with ingredients from fruits and spices that keep your skin moisturized. Each wash product is also offered in a variety of masculine scents. These items can’t be ordered in a subscription format, but $5 to $7 products last through weeks of everyday use. As part of Harry’s budget for 2018, the company has expressed plans of moving into several different categories of grooming and skincare. By the end of the year, we can expect Harry’s to offer a wide range of new skincare products. Harry’s has only recently expanded into the world of accessories, but they’ve started off strong with three masculine offerings: a razor stand, travel kit and a set of Harry’s boxers. The razor stand is perfect for those with a lot of counter space in their bathroom. Using a razor stand encourages all water to roll off your razor. When you’re done shaving, you can simply place your razor on the stand and walk away. When you come back, it will be totally dry. The Harry’s shaving travel kit occasionally ships with certain starter sets, but it can be purchased standalone as well. The kit is water-resistant and highly portable. It’s a great and subtle addition to any suitcase or duffel bag. Last, Harry’s boxers are standard fare for men’s underwear. These navy-blue boxers come with Harry’s logo printed across, and they’re made of 100 percent cotton. What is Harry’s Subscription Plan? The Harry’s subscription plan is very easy to follow; users answer three questions during the signup process and provide mailing and billing information. The company needs to know about your shaving frequency and the products you’d like to begin with. Best of all, Harry’s offers a one-time free trial to all new users. Afterward, users are informed of the recommended time between shipments of Harry’s products. With all default settings, users should expect a three-month time slot between all shipments of supplies. Also, at all default settings, users should expect to pay around $27 per-shipment. Harry’s Razors has exploded onto the scene with a fresh take on the shaving subscription model. As a result, users generally enjoy their time with the company. This is not to say, however, that all users find the products helpful. For example, the flexibility of each razor is a negative feature for fans of a firm shaving process. The lack of alternative shaving blade models makes the brand an automatic no-go for men who require a firmer shave. Thick-bearded men report trouble getting their blades deep enough for clean shaving. More often than not, however, users leave positive feedback on Harry’s products. Customers are happy with the duration that each razor lasts — and the effectiveness of each Harry’s blade. The Harry’s presence on Amazon is limited to the basic starter pack, and it received three stars on that product listing. All in all, a subscription with Harry’s Razors is a worthwhile choice for those who want to simplify the role shaving plays in their lives. Unlike many of its competitors, Harry’s is constantly striving towards improving their products and making their customer’s subscriptions worthwhile. In the coming months, we can expect the company to release a number of new skincare products and accessories. For now, however, it’s all about utilizing the free trial and getting into Harry’s groove. I found the first blades much better than the new blades. Went back to my Shick. Harrys has turned out to be a scam! !! I canceled my membership back in December only to have them charge my debit card on the 4th of march for $21.00 when all I ever order is replacement blades, customer service is horrible! no refund as of yet do not buy! !! So sorry to hear that, Timothy. Hope someone from Harry’s Razors will read your comment and will help you.